An upper body portrait of a young woman posed for the camera in front of a reed courtyard fence, wearing a textile cloth over one shoulder. She has a band across her forehead. Note on print reverse ms pencil - "SSS overall 8.89"
Morton, Chris. 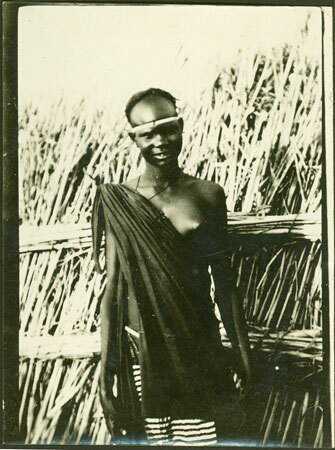 "Shilluk woman" Southern Sudan Project (in development). 03 Jan. 2006. Pitt Rivers Museum. <http://southernsudan.prm.ox.ac.uk/details/1998.348.19/>.